Silver bags are a rarely seen sight in the Chips and Crisps world. This uniqueness sets Salty Dog apart immediately. 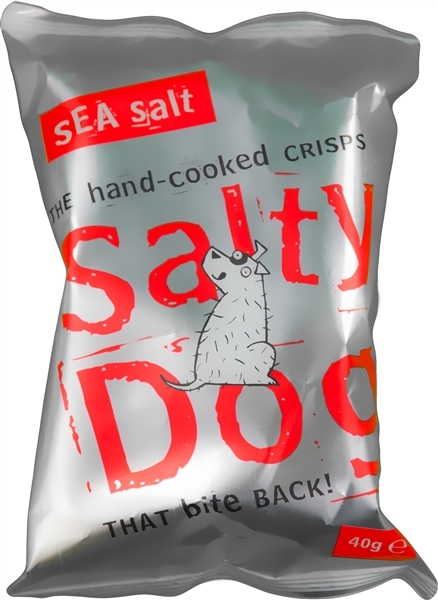 The branding is also impressively original – Although animal mascots often gear foodstuffs to a young market (we won’t name any names Cheetos), the Salty Dog is clearly an energetic yet mature marketing ploy, which could hit a cord with students and adults alike. Each flavour is colour coded in the top left corner, where it stands out very well, and is emphasised in bold coloured lettering announcing the brand name in the centre. Although we don’t generally appreciate branding thrown in our faces so boldly, this package design is quite simply, brilliant. A first crunch of these augured as well as we could have hoped. There was a smart and crisp crack and crumble. Each bite's worth left a gentle degradation in munch before the eventual demise of these perfectly crunch measured Crisps. Curly, wurly, wriggly and whirly - these Crisps were thoroughly irregularly shaped. There were also a fair smattering of oil boils. The general colour was a yellow with a softly infused darker oil soaked demeanour. We won't deny that we are not the best judges of Plain, Ready Salted or Original Crisps at Chips and Crisps. We prefer a bit of flavour, but that is merely an easier measurable element of Potato Crisps. However, as far as these Crisps go - they were an ideal accompaniment for a flavourful sandwich. There was sufficient Salt, but not too much. The warm potato background combined perfectly well to execute the flavour with aplomb. They were however a little overly oily for our liking.